There are currently 2 non-native mosquito species in California at this time. Neither species has been detected within the Turlock Mosquito Abatement District boundaries. The district does provide surveillance for these species to prevent their establishment in our communities. Both of these species are aggressive, day biters, and readily feed on humans. They are capable of transmitting diseases such as Dengue, Chikungunya, and Yellow Fever. Aedes albopictus (The Asian Tiger Mosquito) was first discovered in California in 2001. It arrived in a shipment of Lucky Bamboo from China. The pest was eradicated after much effort and more stringent monitoring of shipments was put in place. This species was rediscovered in Southern California in 2011 around the cities of San Gabriel and El Monte. Districts in those areas are continuing to battle this species to prevent its establishment. Aedes aegypti (The Yellow Fever Mosquito) was discovered for the first time in California during 2013. Aedes aegypti was collected in Madera, Fresno, Clovis and San Mateo. The close proximity of this recent discovery to Turlock Mosquito Abatement District is of great concern and has heightened our surveillance. Eradication of both these species will be difficult due to their preferences in habitats such as small containers, items around homes or under protective vegetation. These types of habitats make it difficult to detect their presence and to apply control measures. Residents can be vital to our detection and eradication of this pest. For more information see the “Invasive Species” section found under Resources. 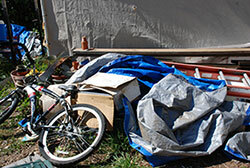 Put away or throw away all containers where water can collect in yards. Even trash, chip bags, and wrappers are good places for these mosquitoes to lay their eggs. Empty bird baths and small fountains completely or clean them thoroughly every 3 days.